An HPO diagnosis of the current strengths and weaknesses of the organization, in comparison with the peer group and – even more importantly – with the absolute scale of HPO gives insight into where the organization currently stands in the competitive field. Improving is good, but randomly starting improvement actions is not. The diagnosis pinpoints the organizational areas where improvement is needed. The organization uses the HPO Diagnosis as motivation for its people to keep improving, because – as the diagnosis will show – there are always areas which can be improved, even in organizations which are already doing quite well. The goal of the strategic plan is to improve the organization so it can excel and beat the competition. The diagnosis gives direction to the strategic plan in the sense that it highlights the areas in which the organization has to strengthen itself. Organizations often undertake many improvement efforts and implement a plethora of improvement techniques – such as total quality management, six sigma, the balanced scorecard – but they are not sure whether they are implementing the right improvements and are using the most effective techniques. The diagnosis shows the areas where improvement is needed and subsequently indicates whether the improvement techniques used by the organization are adequate or if maybe other or additional techniques are needed. Becoming an HPO is a great cause to rally behind as it involves every organizational member partaking in realizing a better future. The diagnosis makes people aware of how that better future could and should look like and what is needed to get there. Most organizations have management development courses but the content is often of the shelf and quite generic. The HPO Diagnosis shows how the managers of the organization score on the HPO factor Management Quality. Thus information becomes available as to which HPO characteristics these managers have to strengthen themselves, and management development courses can be tailored accordingly. This is often said in relation to the dealings the organization has with its customers and suppliers. The HPO Diagnosis shows how the organization scores on the HPO factor Long-Term Orientation. Information comes available whether the organization is good enough in its dealings with stakeholders – and especially customers and suppliers – and specific training courses can be set up for strengthening the HPO characteristics in question. What is your reason to start the journey towards an HPO? 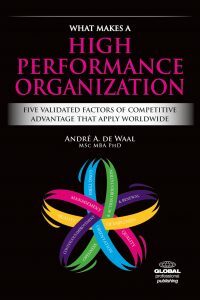 Read also the article: Added Value of the High Performance Organization Framework!